The annual sale of breeding ewes at Armoy Mart saw good prices for strong sheep but poorer lots were harder to sell. Top price was £166. 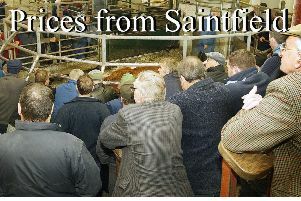 LEADING PRICES: Chris McKiernan, Ballymoney, 12 Tex, £166. Vincent McNeill, Ballyvoy, 18 Mules, £150. V & C McCaughan, Ballyvoy, 10 Texel’s, £144, 10, £141, 10, £139, 10, £138. J Simpson, Mosside, 8 Tex, £142, 8, £136, 8, £134, 8, £132, 8, £131. J P Black, Ballycastle, 10 Mules, £142. Frank McClure, Ballymoney, 8 Tex, £140, 6, £140. Michael Kane, Cushendall, 14 Tex, £139. D McAlister, Cushendall, 11 Mules, £135. Chris McKiernan, Ballymoney, 12 Suff, £135, 8, £131.